Most of the seven artists in the SHOP exhibition are London-based and include Paris Ackrill, Hermione Carline, Amélie Ducommun, Caroline Hall, Katherine Lubar, Lucienne O'Mara and James Ryan. Visions of Abstraction is a bold and colourful artistic statement; a showcase and celebration of the gallery's new platform. Originally training as an anthropologist (University of Edinburgh, 2013), Paris Ackrill is now working as a London-based artist. Ackrill’s photographs highlight mankind’s connection with the natural world – much of her work features abstracted, interconnected images of humans and nature. Her work is in many private collections, and in 2012 she received an award from National Geographic Traveller. Hampstead-born Hermione Carline is an English painter and printmaker. She began her studies with a BA in Fine Art at the Camberwell School of Art and finished with an MA in Design & Surface Decoration from the Royal College of Art. Carline’s first career was as a textile designer, working with designers such as Ralph Lauren, Pierre Cardin, and Christian Dior. She turned to fine art in 2004, and later took courses at the Putney School of Art, where she was awarded first prize in both Drawing (2013) and Experimental Media (2014). The geometric delicacy of Carline’s work reflects her interest in the simplicity of traditional Japanese painting. She has participated in The Other Art Fair since 2013, and has also exhibited at EWAAC (East-West Art Award Competition) exhibitions in both Japan and London. Amélie Ducommun (b.1983) is a French painter living in Bordeaux. She graduated at the top of her class at the National School of Decorative Arts in Paris (2008). Using a variety of media, including crayon and oil paint, the works Ducommun creates are delicate visions of an imagined landscape. Her images are abstract, but she often incorporates motifs that have been drawn from the natural world, such as leaves and flower buds. Her work has been exhibited in cities around the world, including New York, Paris, Barcelona, and Beijing. Caroline Hall is an English painter. She worked as a television presenter and reporter for the BBC for 15 years before moving to Berlin in 2000. Upon returning to London, she began studying Visual Art at Winchester School of Art (2004, First Class Honours) and completed a Masters in Painting in 2007. Her art is inspired by her time spent as a broadcast journalist, and her work reflects her interest in the effect of video on visual perception. Her paintings often feature images that have been blurred or fragmented. Lucienne O’Mara is a London-based painter. She undertook a foundation year at Camberwell College of Art & Design (2008), followed by a BA in Fine Art Painting at City & Guilds of London Art School (2011, First Class Degree) and a placement at Turps Banana Studio Programme (2012–2013). 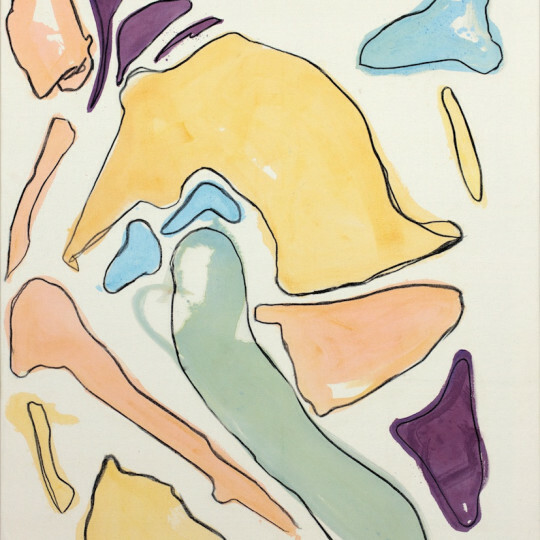 Her artistic technique is distinguished by the use of delicate, coloured abstract forms on unprimed canvas. Her work has already made its way into numerous public collections, including the Currell Collection, John Jones, and Simmons & Simmons. James Ryan (b.1982) is an English painter living and working in London. His formal fine art study began with a BA in Fine Art at Northumbria University (2001–2004), where he received the John Crisp Painting Prize. He subsequently attended the Royal College of Art, where he received an MA in Painting and was awarded the Conran Foundation Award.